The ABFriday Forum, managed by Stacy Fischer is an opportunity for photographers of all levels to exchange ideas of making creative adjustments in a photograph after the shutter has closed. 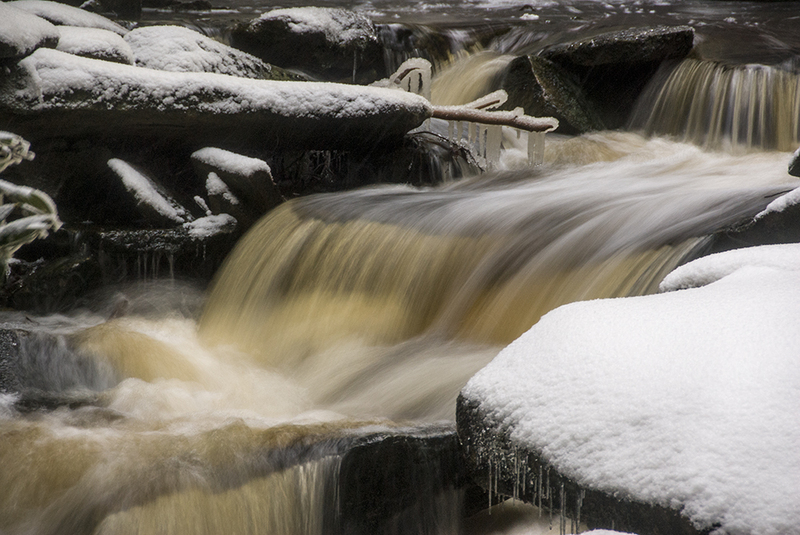 My submission this week was taken five years ago this week in West Virginia’s Blackwater Falls State Park. The stream is Shays Run, just below Elakala Falls. And if you think it looks cold, you are right. Please visit Stacy’s Visual Venturing site to see the other submissions. As usual, the first step in my workflow was to open the image in Adobe Camera Raw. The adjustments made are shown in the image above. The settings were as follows: Exposure: +0.20; Highlights: -2; Shadows: +58; Whites: +58; Blacks: -33; Clarity: +33; Vibrance: +23. The goal here was to bring out the white in the snow and to open up the shadows in the dark areas. But I knew a little more work would be needed in Photoshop. I didn’t like the brown color of the water in the image, even though it is a natural condition resulting from tannic acid of fallen hemlock and red spruce needles. You have to be there to appreciate it. I decided to go with black and white. But first, I wanted to get a little more detail in the snow in the upper left and lower right corners. This was accomplished with a Levels Adjustment Layer (Blend Mode Normal). Then I used Channel Mixer, checking the box for Monochrome and staying with the Default settings. The image was still a little flat, so I used a Curves Adjustment Layer (Blend Mode Normal) to increase the contrast. Other than the conversion to Black and White, the adjustments are relatively modest. I felt radical surgery wasn’t needed and I’d be interested in your thoughts. And don’t forget to check the other submissions at Visual Venturing here. This entry was posted in ABFriday Forum, Landscapes and tagged ABFriday, Black and White, landscape photography, Photoshop, techniques, travel, United States, West Virginia by Robin S. Kent. Bookmark the permalink. Thanks for your comment, Kenny. An interesting take on the choices. Of the three, the color version after the adjustments in Adobe Camera Raw was the closest to what the scene actually looked like. Welcome back. I prefer the edited version, because I find that colored water distracting, too. All in all, a simple post-processing resulting in this stunning image. Thanks very much for your comments. It’s good to be back, but I fear I will be taking another temporary departure due to an trip to a disconnected spot (Antarctica) for about three weeks. Hopefully, I’ll bring back some interesting new imagery to feature on the ABForum. Ah, yes… Antarctica. I wish you safe trip and many opportunities for great images. I like the color adjustment and the final equally. A really good photo doesn’t need to be touched too much in post-processing, and this really one shows that. Nice work. Thanks, Nancy both for visiting and for the comments. I appreciate your feedback. I always like black and white, simply because you focus on the image, and not the colors. So very nice! Thanks, Mary. I usually lean toward color myself, but often I find that B&W makes a stronger image. Nice work Robin. 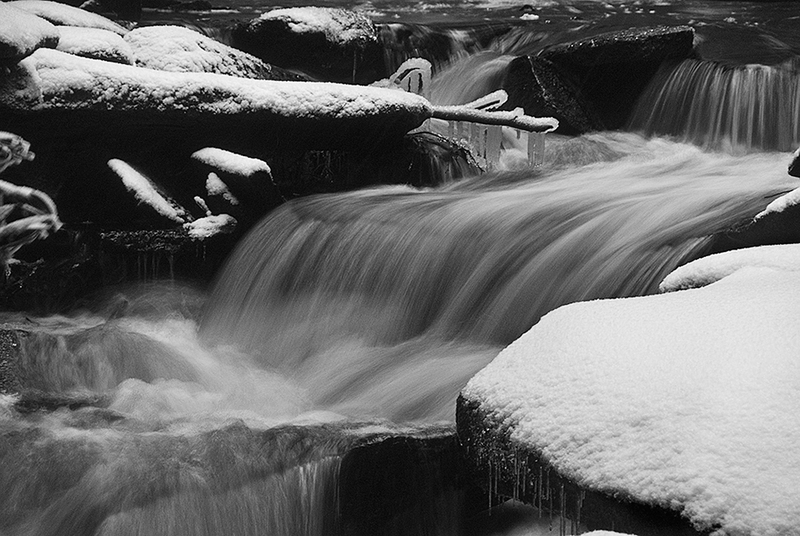 The black and white really accentuates the image, it draws attention to the cold and the movement of the water. Its a nice image to start with, great composition, so worked well with the light touch! HI Robin, I love the black and white version. isn’t it nice when a works just the way it is. I hope you have a great weeken. Thanks for the visit and comments Janice. Sounds like you’re doing well in Spain. Hi Robin, Converting the shot to black and white works nicely as the scene was already quite monochromatic which emphasized the colour of the water more. In the end you have a very good picture. Thanks, Ben. I appreciate your thoughts, as always. Not to worry; I’ve been called worse things;-) And the delay in this response is due to the fact that I had literally just left for that long trip when you posted the comment. Now that I’m back I can be more prompt in replying…..hopefully. Black and white seems like the only smart choice when, as you say, the scene was already monochromatic. I like what you did to bring out the texture of the snow. Even though the unprocessed raw image is the natural one, I really like your adjustments. The photo in black and white emphasizes on the iciness of the weather and makes the white color stick out to the audience. This is probably unrelated, but when I first saw your third photo, I related the stream of water to smooth, shiny hair someone is laying on the rocks. I wouldn’t have thought of this had it not been for your adjustments. Thanks so much for sharing! Hi, and thanks for your comments. I like your analogy of the hair; I hadn’t thought of it that way, but now that you mention it, I can see what you mean. This is why it is so interesting to get the reactions of others to one’s work; you get to see what you produced through different eyes and in new and interesting ways.